Termites (sometimes referred to as “white ants” in Australia) are pests that causes fear in the heart of every building owner . . . and with good reason! This “unseen enemy” causes hundreds of millions of dollars damage in Australia every year and because of their ‘modus operandi’, termite damage can go unnoticed until it’s too late so knowing how to get rid of termites from your property is crucial. A termite’s life is one continual hunt for food . . . and that food is wood. A termite doesn’t discriminate, it will eat wood occurring in nature or it will happily eat wood used in construction, for example . . . your home! In Perth we have an ideal cocktail of circumstances that makes life very comfortable for a termite. Perfect climatic conditions, a good mix of sandy soil conditions combined with warmer, moist temperatures (particular from September to January) plus densely populated areas with large concentrations of housing and commercial buildings makes our state a haven for the termite pest. 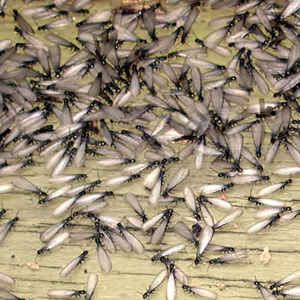 Make no mistake, termites are ever present and in their natural conditions will forage underground in search of dead or decaying wood to eat but if, in this foraging, they come across building material, such as the wood in your home, they can’t differentiate and will happily attack that source of food as well. Termites are a social insect that live in colonies that can easily contain a million or more of their kind. They have a known social structure with a king and queen, workers, soldiers and Alates (winged termites that fly out to establish new colonies, lose their wings and become future kings and queens). In the main, termite nests are underground however in some tropical areas of Queensland and northern Australia huge above ground termite mounds can be seen. Soil contact is desirable but not essential for termites to survive, as long as they have a moisture supply and security in their habitat indeed, termites have been found in many places far removed from soil such as the top of multi-story buildings and even on boats! 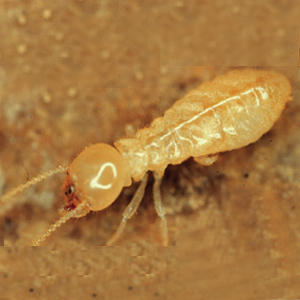 Termite activity isn’t restricted to a close proximity to a nest and termites have been known to forage 50 – 100 metres from their nest in their search for food. 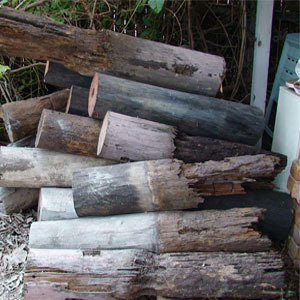 Termites do play a vital role in nature by recycling dead and decaying wood however in doing this, as was mentioned previously, they can’t tell the difference between the wood of a dead tree, the compost mound you have out the back or the wooden component of your home. Once a source of food is found, termites will strip and partially digest the wood before returning to the nest to feed the colony. 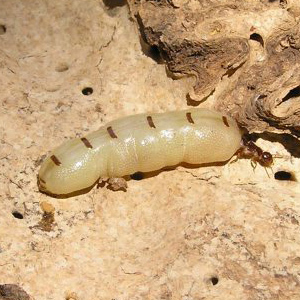 In the process of eating, a termite colony prefers darkness over light and for this reason when they find a food source, they will eat the wood from inside and leave a thin wood veneer on the outside to protect them and keep them shielded from sources of light. This action can happen in a very short period of time (months) and gives rise to termites being thought of as an unseen enemy. Yes, a termite’s diet is wood however they will stop at nothing in their quest to reach a food source and this is where a proper inspection, conducted by a licensed pest control technician, is essential in determining whether termites have invaded your home. He will then advise you on the best course of action on how to get rid of termites from your property. Knowing the likely movements of termites on a property is essential. Termites can and do travel through concrete and brick for example. Termites will ingress into a home via small cracks or openings in concrete or brick walls or slabs. They will track across these structures and travel, vertically or horizontally, to locate a source of food within a dwelling and evidence of this can sometimes be seen by brown trail or mound on a wall this being a mixture of soil, saliva and termite faeces. In a home, termites will eat anything made from wood or contains cellulose. They will devour timber flooring and timber ceiling joists, they will eat architraves, skirting boards and wall studs and they are ravenous for plasterboard which they will eat from the inside leaving a thin layer of paint on the inside to hide their activities. Steel framed houses are not immune. 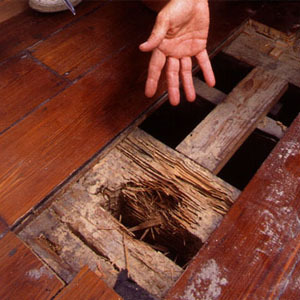 Termites will invade such a home and eat wooden trusses, furniture and even damage electrical wiring. 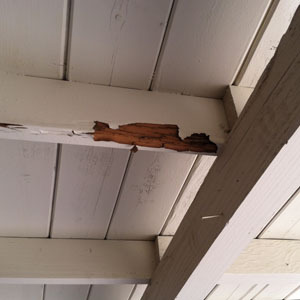 Termite damage can be extensive! In Western Australia we also have another issue. Here, most homes are made with a double brick construction unlike other areas of the country that tend towards brick veneer. The double brick design means a cavity exists in a wall between the bricks and this provides a perfect location for termites to operate affording warmth, moisture, food and security. Termites are very social creatures and in fact their sheer existence depends on this. They work together to construct a nest, move en masse to locate a food source and return it to the nest and even groom each other along the way! This sociability is their strength however it’s also a weakness than can be exploited to lead to their destruction. • Initial Assessment – one of our senior inspectors will do a free on-site assessment of your property to Building Code Of Australia Standards and give a recommendation of the possible extent of our services that may be required. • Thorough On-Site Inspection – every property is different and we personalise our service to make sure the treatment we provide is tailor made to your circumstances. To this end, one of our licensed technicians will then do a thorough survey of your building and surrounds. This will involve not only perimeter checks, but detailed inspection and measurements of your home, from top to bottom, as well as a complete outside check to determine the extent of any current, and possible future, termite activity. Perth Pest Control’s technicians are well versed in the habits of termites and know what signs to look for when checking a home for termite invasion. 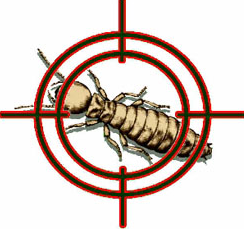 • Treatment– after an inspection we will then discuss with you the best type of termite treatment for your premises. 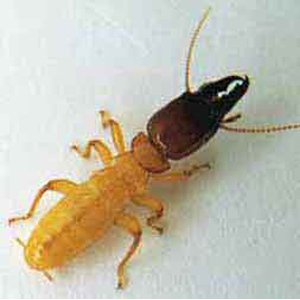 Termite treatments 30 or 40 years ago used to involve chemicals that had question marks over their toxicity and the effects on humans and these have now been banned but since then the advances in chemical science has been nothing short of amazing to the point where our treatments can not only provide a barrier from termites entering your home, but can destroy all the occupants of a termite nest AND be completely safe for you, your family and even your pets! As well, these water based chemicals can be potent for termites for up to 8 – 10 years in most cases. It is with the use of these chemicals that the social factor of the termite can be exploited by the carriage of the toxin around and deep into a nest to kill all the inhabitants. • Follow Up Inspections – this step is crucial. Once termites have been found on your property, and a treatment has been performed, it’s important to do follow up annual inspections. 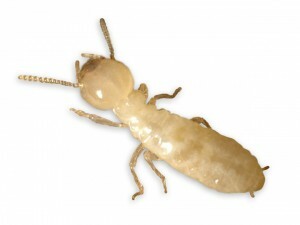 Make no mistake, our termite treatments are the most effective and up-to-date methods found on the market today however, termites are clever and your circumstances may have altered (for example, you may have done home renovations) and so it’s important to have follow up annual termite inspections on your home. Your home is your largest investment and our neglect of the termite damage that can happen to your home can be a recipe for disaster. The Perth Pest Control team have a vast knowledge of termites and their habits in Perth and are well versed in the elimination of these pests. Contact us now for an initial termite inspection on your property. Is Perth a high risk area for termites? According to CSIRO data yes. 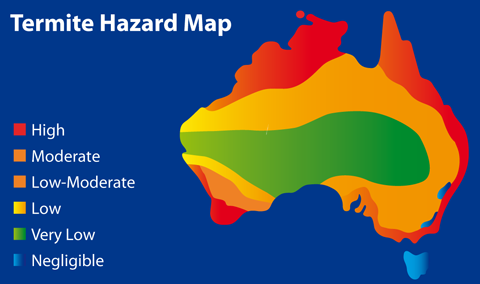 All of Australia seems to be a high risk area for termites but Perth in particular, due to a combination of factors, falls into the very high risk category. Here we have a very large and aggressive species of termite, Coptotermes Acinaciformis, which also collects in extremely large colony sizes and enjoys the natural timbers we use in construction as well as our sandy soils. I’ve just noticed termites have eaten some wooden shelves I had in my garage, should I worry they could also be in my roof now? Without wishing to alarm you, there would be cause for concern. Understand that the termites you’ve seen won’t just be satisfied with your shelves and then move away, they’ll look for more food sources in the vicinity. Other members of that termite colony may currently be in your ceiling, or may be in the future, so seek professional advice from Perth Pest Control on how to protect your home. Why do some people call termites white ants? Probably because of a long running series of TV commercials many years ago. Termites are not ants but possibly because of their colony structure and highly organised nature like ants, past advertising executives perhaps thought the term ‘white ant’ would register stronger than ‘termite’ with their target audience. I keep hearing about termite barriers, what are these? They are quite literally a barrier to stop termites from entering a construction whether it be a shop, warehouse or home. A barrier can take the form of a liquid chemical barrier or a physical one such as stainless steel mesh. They all aim at achieving the same end (stopping termites) however which one suits your purposes is best discussed with the experts at Perth Pest Control. When you inject the liquid chemical into soil around my house, does it matter how far apart the injection holes are? Yes! Chemical termiticide manufacturer’s specifications demand injection holes be no more than 300mm apart for correct dispersion of the liquid into the soil. Any greater distance than this may create a weakness (or hole) in the barrier leading to an entry point for termites. Perth Pest Control are meticulous in how we space our injection holes and in fact our technicians are trained to carefully measure not only the spacing between injection holes, but also the distance from a wall to create an effective ‘shield’ around that particular construction. Are the chemicals you use for termite treatments safe for my family and pets? An oft asked question. Firstly, the chemicals in use in the pest industry now are much safer than was used in the past. At Perth Pest Control we go one step further and use only water based treatments rather than solvent based. Water based means no lingering smells and dispersal of the chemical component is just as effective as solvent based but more rapid. The treatments we use have very low toxicity levels and we only use them outside a building. In fact advances in technology have now produced a new liquid treatment that does not even register on the Australian Poisons Schedule. Ask Perth Pest Control for more details. I found termites in my house will you spray inside like you would outside? A resounding no! Liquid treating inside premises is unsound practice as it may not eliminate a termite colony and if they’ve managed to infiltrate a home, you may only be seeing part of the colony and a liquid treatment may only eliminate a small section of that colony and not the whole thing. Internally, if termites are spotted, we would only initiate a termite baiting programme and follow a university documented procedure that will eliminate the entire colony of termites. If you want a liquid treatment inside your home or business we would recommend talking to another company as we know this type of practice is only a short term stop gap measure. Your office recommended a baiting programme for my premises, why is this more expensive than your liquid barriers? Baiting is the only sure way to eliminate a termite colony. It was developed by authorities at the University of Florida as well as Dow Agroscience and remains the only sure method of complete colony elimination available on the market today. It involves the use of highly developed chemical baits that have cleverly devised termite attractants built into them and as well, a baiting programme involves meticulous regular monitoring by trained technicians. Yes, baiting is a more expensive option but we know it works extremely effectively against termite invaders and keep in mind it takes 3 – 6 months to eliminate a termite colony using baiting and a queen may live for up to 50 years overseeing a colony of up to 5 million termites! Why do I need a regular 12 month inspection for termites? The Building Code of Australia recommends this period for consistent termite protection around a construction. Whilst the chemicals we use can have up to a 10 year warranty, no termite barrier is going to be 100% effective forever. Things change. It may be you’ve built a new shed, added a garden bed near the home or undergone some other sort of renovation or addition or perhaps a plumber has added a new downpipe or sinkwell. 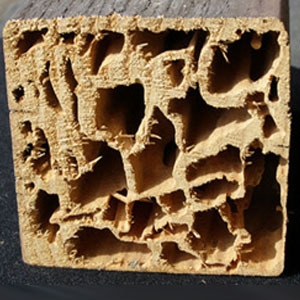 These, and other factors, may cause a breach of a termite barrier so it’s crucial not to take a ‘set and forget’ approach with termite barriers. What also needs to be kept in mind is that termites are devious and may find alternative routes around a barrier if the opportunity presents itself. I just noticed a sticker in my meter box showing my home last had a termite treatment 5 years ago, do I need a check now? 2 points to consider. Firstly, in 5 years things done around your home may have disturbed the original treatment and anyway, you probably don’t know what sort of treatment was done 5 years ago and whether this treatment was conducted to a satisfactory standard. Secondly, you haven’t had any annual inspections so the level of termite activity around (and possibly in) your home hasn’t been checked so yes, we would advise firstly having a full termite inspection followed by a termite treatment that would involve a liquid termite barrier and possibly baiting if termites have penetrated the internals of your home.